High quality glass wind guard specially designed to complement as well as provide additional safety for HPC fire pit inserts of all shapes- round, square, rectangle and linear. 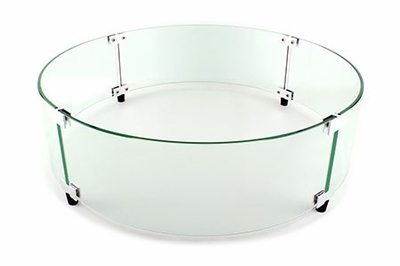 These feature a durable tempered glass construction to ensure a long lasting, heat resistant product. Wind guards reduce flame disturbance of your fire pit and prevents loose items from getting too close to the flames. •Tempered Glass - Heavy duty 3/16” clear glass is tempered to improve durability and allow it to withstand high temperatures. Depending on wind guard size- 4 or 6 sections complete the desired shape. •Brackets- Polished aluminum brackets and plastic support feet provided.